In March 1933 the U.S. Congress established the Civilian Conservation Corps as a relief program for unmarried young men between the ages of 18 and 25. Within three months, 250,000 men had enrolled. Nicknamed the "Tree Army," the CCC planted trees to combat soil erosion and maintained national forests; eliminated stream pollution; created fish, game, and bird sanctuaries; and conserved coal, petroleum, shale, gas, sodium, and helium deposits. About 2 million young men took part nationwide during the decade. 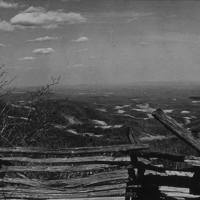 By the program's end in 1942, more than 100,000 CCC men in Virginia had built 986 bridges, planted more than 15 million trees, strung more than two thousand miles of telephone line, and stocked rivers and streams with more than 1 million fish. This photo is part of the collection of photographs prepared for the Virginia Room Exhibit at the 1939 World's Fair in New York City. 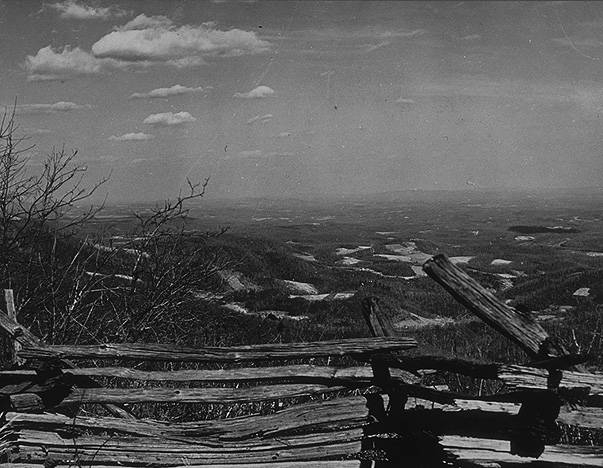 In Their Shoes: Write a diary entry as if you were a member of the CCC working on the Blue Ridge Parkway. Debate: The CCC is just one example of a New Deal program that sought to employ Americans who could not find private employment. Do you think the government should create jobs for the unemployed? Why or why not? 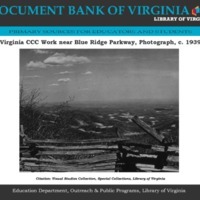 “Virginia CCC Work near Blue Ridge Parkway, Photograph, c. 1939,” Document Bank of Virginia, accessed April 21, 2019, http://edu.lva.virginia.gov/dbva/items/show/78.